Looks great! Would you mind sharing a link to the epoxy gelcoat? Hello All! I was able to trick Santa again this year, and he kept me on the nice list. With some help from the gents at SSA, he brought me 2 new XCon 12s....WooHoo!! It's finally time for me to get building and put these suckers to use. This will be my first time building a box, but this creates a perfect excuse to buy more tools. I would like to reach out to you guys and get some experienced advice to help in my first quality build The car is a 2008 Pontiac G6 GT Coupe. It has the Bose Monsoon system, which isn't terrible for a factory unit. Unfortunately, all of the cars display features are integrated in the factory's HU display. For this reason I will be keeping the factory HU inconjunction with a line output converter. I'm using a LC6i now, but am open to getting a better unit. I know this is not ideal, but I do not like any of the replacement units offered, like the Metra. Here is my current installed gear list: Stock alt, Yellow top battery, big 3 with 1/0 wire, Audiocontrol LC6i, BC2000, 2 Type R12s, stock monsoon 3way fronts and rear 6x9s. The planned setup is: HO alt, 2/0 wire (already purchased), BC3500, 2 batteries, 2 channel amp and component speakers. I'm not sure weather to go 2 or 3 way for these speakers, as my front door is already built out for 3ways. Either way I have some time to work on that decision. Box Design: My current task at hand is to build the largest box I can fit through the trunk opening. I plan to fire the subs into the cabin, as my rear seats fold down easily. I have done a mock build, and the largest dimensions I can squeeze in there is 26Lx35.5Wx13.5H. I want removal to be easy, so the largest I would build is 25x35x13.5 as the Max external dimensions. This gives 6.6ft^3 gross. Calculating losses with a double front wall, .25 for port and .15 for each sub yeilds 4.74ft^3 of net internal volume. I am going to build a removable port assembly, so tuning is adjustable & I don't have to go through the process of building an entire box again. 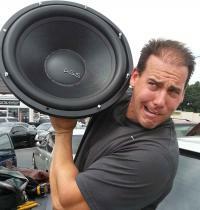 I have quite few question for you experienced builders/tuners: Is 4.74ft^3 a good volume for 2 XCon 12s? What is the ideal net internal volume for 2 XCon 12s? Should I double wall the face? I am building this for use with a BC3500 on good electrical. Should I build box out of hardwood (like Birch) or 3/4" MDF? I have no issue in working with either. I plan to face subs and port into the cabin with the port in the middle. Anything wrong with that setup? Thanks in advance for your advice here guys! I try to be thorough so I don't waste time & money redoing mistakes...DOH!! The Damp-Pro works great! I grabbed 100ft^2 on a B stock sale last year. Most of it looked like A Stock. Monster opening in the Avalance, Nice! How's it hit? You may already have the power wire you need, but I just bought 75ft of 2/0 EB Flex for $157 shipped from Electron Beam. Why is there a gap above the sealed section? Keeping port width the same, port area drops to 77.63in2 @ 30" in length, net volume drops to 5.31ft3 and tuning rises to 31.32hz. I hear ya...no worries! You can do WAY better with the prefab than the guy in that video. Using a kreg jig, you can screw from the inside of the box, getting perfect screw hold until the glue dries. A lot of guys use this technique, like Frogcase in his it trunk build on page 25. That was an excellent box btw! Are 2 Zcon 18s the current subs to build around? Do you know anyone that can weld well? It would be no different than mocking up a roll cage for an autocross car, on much smaller stage. Once the outer frame was intact, you could build the inner angled struts to be removable. I would be happy to help you mock up all the tube stock needed to make this work. A good friend is an engineer with a badass Miller mig/tig welder. I'll ask if this is something he would be interested in. If not, I too think you may need to build this sucker inside the trunk. I think you have pretty good height IIRC. Ball park, what dimensions do you have to work with? Where are your clamps? Even with a not so perfect cut, you could have clamped her tight, then screwed it while the glue dried. To seal that corner, I would first scrape all glue off and give it some 80 grit roughing up. I would then glue & screw a solid 45 in that corner. Once dry, you could even throw one more layer of mdf over the 1st 45 if you wanted. No way in hell the corner will leak then! Not sure why the guy cares about painting metal he is about to cover with sound deadener, but to each their own. That hot knife might not be a bad tool to add to the collection. I will give another positive vote for Damp Pro. It's great stuff! I appreciate the offer, but the EB-Flex is so reasonable new, I prefer the piece of mind of buying new wire. This thing's gonna be wicked with 4 15s!! Will you strap 2 3500s? I definitely like where you're going with this! From what you have suggested, my vote is 2 Zcon 12s on the 5500. No way 1 15 on a 3500 would be as loud. Of course the only way you would get this big ole box in there is from inside the car. I have seen a couple builds where frame work was cut supporting the rear deck and bolt in struts were fabricated to keep body rigidity. I too am considering something of this nature to get more room for my 18s. Will you post a pic with your seats down? I think you have a good amount of height IIRC. best crossover frequency for 12's and slope? It would be pretty easy to take accurate dimensions of the box and plug it into some software. Beautiful subs!! Which model are they? I didn't see 120lb listed for any on the B2 site. New here New Home? Why Does **** Suk? Welcome. Who is this ANt you speak of? Beautiful setup!! Will you still be running 3 subs? If so, how does that wire up on 4 amps? Thanks, I'm very excited to hear these! When driving at highway speeds with rpms 1700+, I can't drive the Xcons hard enough to drop below 14.2v, on any song/tone/bassboxing edit. Now when sitting in a parking lot playing the same Bass tune at the exact same volume, my voltage will drop to mid 13s. I even bump the revs up to 2500 to make sure I'm getting all possible output the alt has. I cut a stick to fit between my power seat and gas pedal, allowing to finely adjust & hold the car's rpms while checking/adjust things. Anyone else experience this type of voltage change? Additional power draws are not an issue, as I turn of lights, heater, etc. when testing parked. All connections are 100% sound with big wire. I also have a new tight serpentine belt. I haven't asked mechman directly yet, but I need see what they say. I did some more measuring today, and I can go a little taller to 28.5" and still see with the rear view mirror. Any issue running the port the full width on top? I will definitely give it strong bracing! Thoughts? Here's the revised Torres.